Albrecht Ritschl, who is an economic historian at LSE, has published a great blog post comparing the help Germany has given to Greece in recent years with the financial assistance packages offered to Germany at various points in the 20th century (the Dawes Plan of 1924, the Young Plan of 1929, and the Marshall Plan of 1948). As we all know, German taxpayers have footed the lion’s share of the bill to assist Greece and other Eurozone countries. Defenders of this arrangement argue that the poorer Eurozone countries have a moral claim on Germany because the latter became rich as a result of Marshall Plan assistance from the United States. The use of this historical analogy has provoked widespread debate. Poster promoting the Marshall Plan. Ritschl’s blog post of yesterday was prompted by a 12 June New York Times piece in which the economist Hans-Werner Sinn of the University of Munich invokes comparisons with the Marshall Plan to defend Germany’s position against Eurobonds, the pooling of sovereign debt within the euro zone. Sinn argued that Germany has given Greece vastly more than it was itself given by the United States. Ritschl questions Sinn’s numbers, arguing that he has underestimated that amount of aid given to Germany under the Marshall Plan and has overestimated that amount of help Germany has given to Greece. According to Ritschl, the financial assistance packages given to Greece in recent years are more like the Dawes Plan of 1924 than the generous Marshall Plan of 1948. Under the Dawes Plan of 1924, Germany’s currency had been put back on gold but Germany went on a borrowing binge. In a nutshell, Germany was like Greece [in the early 2000s] on steroids. To stop this, the Young Plan of 1929 made it riskier to lend to Germany, but the ensuing deflation and recession soon became self-defeating, ending in political chaos… As far as historical analogies go, what Southern Europe received when included in the euro zone was closer to a Dawes Plan. And just like in Germany in the 1920s, the Southern Europeans responded with a borrowing spree. In 2010 we didn’t serve them a Marshall Plan either, but a deflationary Young Plan instead. This latter-day Young Plan is not even fully implemented yet. But we see the same debilitating consequences its precursor had around 1930: technocratic governments, loss of democratic legitimacy, the rise of political fringe parties, and no end in sight to the financial and economic crisis engulfing these states, no matter how many additional aid packages are negotiated. Woe if those historical analogies bear out. 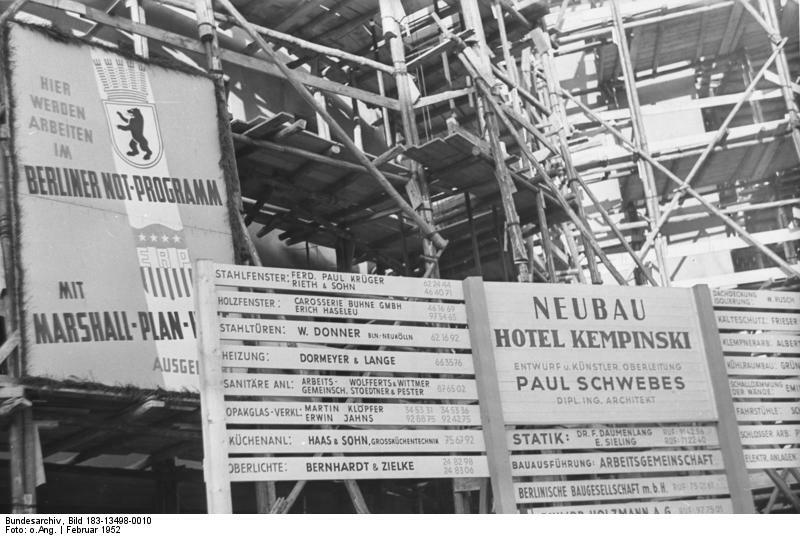 Hotel being built in West Berlin with Marshall Plan money, 1949. Note the number of sub-contractors (windows, wiring, etc) who were involved in this project. Based on my limited reading in this area, I’m inclined to think that Ritschl has a better argument than Sinn. I understand the frustration many German taxpayers feel with Greece. Much more needs to be done if this currency union is going to work. (In fact, I’m not convinced that a currency union of territories in which different languages are spoken is compatible with democracy). However, I think that the attitude of much of the German populace towards Greece and other poorer parts of the EU suggests a distinct lack of awareness of and gratitude for the help Germany was given in its hour of need in the late 1940s. I note with interest that Professor Sinn was born on 7 March 1948, less than a month before President Truman signed the Marshall Plan into law. 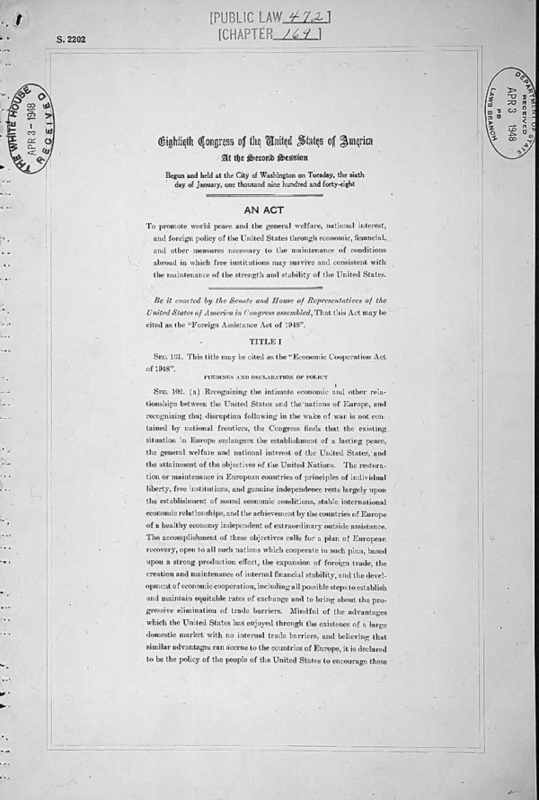 The US law authorising the Marshall Plan.